Cheers. Already had it added to basket off last time when I'd missed it. Got it this time. Let's face it - people are more likely to leave a bad review than a good one. Look at John Lewis' TrustPilot page! The majority won't have an issue - it's all down to the construction of your house, layout of your network, and localised congestion. It's an unneccesary expense to include it in every box. Xiaomi video doorbell. See link for details. Yes think so. As mentioned mainly use for doorbell recording. The Yi is on permanent record. Never miss a 'Doorbell' deal again! Which camera/system is this? Looking for a new one, but only really seen Swann doing heat detection - most the others are motion alerts, which can be noisy in the wind. Interesting. I think I'm going to get a price match from JL and take a punt on it, if its not up to the job they can have it back as it is a very expensive door bell to not work as advertised! My Hello is on the latest software version according to Nest. I see lots of varying comments on this. Have you updated it? APPARENTLY, Nest have addressed the delay this year and its much better. 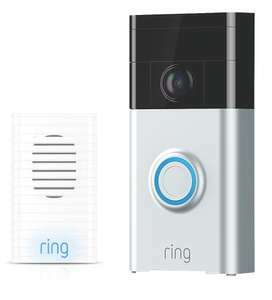 RING Video Doorbell 2 & Chime Pro Wi-Fi Extender & Indoor Door Chime Bundle for 149.00 at Currys. Free delivery and free C&C. That's showing as £189 with no bundle offer. It was £149 when posted yesterday. I managed to get one with £1.26 TCB and a further 20% off due to my friend purchasing one at the same time, he gave me a Currys 20% off ring products voucher. So approx. £125 for me all in. Okay.. and why, pray tell, would you tell a stranger that? This isn't rocket science. Any recommendations for this please? Screwfix have stopped selling this it seems.. Useful. Its amazing the Nest don't supply this given the cost! Just in case this is useful for anyone in the future: Mine arrived. I connected it to an 18V 800mA wall transformer to test it out. It kept turning on and off and after a while stayed off. Later I realised the transformer had broken. Then I tried a 19V 2.4A wall transformer. Again it kept turning on and off. When I switched the 2 wires around (+ and -) it worked fine. I had previously read somewhere that it didn't matter which way round you connected them. Turns out it does. It's good but the nest aware sub is expensive I think! A good deal compared to normal prices on screwfix but you can easily get one with two speakers for the same price online through ebay, amazon etc. Got myself one and far more competitive than anywhere else I can see on the web. Get one before they're out! Worked for me!! Nice one Smash77! We was talking about Costco membership lol I’ve already added Ring’s subscription to the extra info. No. Membership allows you to access previous recordings for up to 30 days. 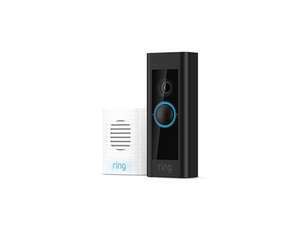 Does this need a door bell ringer or can I use alexa to announce it? 1st gen been this price for a while. £5 off is across anything on amazon. £1.00 cheaper than the deal from 8th Feb 2019. It is still a good price although it's not the best in history. Thanks for that. It's just something picked up online stating; "At 1600 x 1200, Nest Hello requires 800 to 2000 Kbps of upload bandwidth while streaming video. 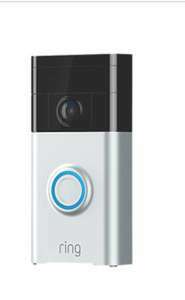 Nest Hello will use more bandwidth to stream video when there is more motion in the scene. If you subscribe to Nest Aware, your Nest Hello streams all video to the cloud for secure offsite storage. At 1600 x 1200, each Nest Hello could use 150 GB to 600 GB of upload bandwidth per month depending on the video quality setting." Not really. From my experience, I get push notifications on my phone and it says either "nest hello has heard a sound, or nest hello has spotted someone or someone is at the door (if they ring the bell). You can set all these and turn then off etc. And also, it goes into standby low power and starts up when it notices activity. I've not noticed a major jump on my data. 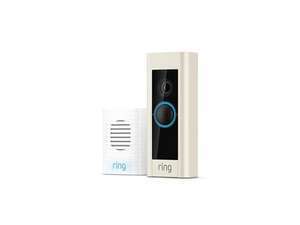 I believe the Nest transmits 24/7 so it must use a lot of bandwidth compared to the Ring equivalents. Also, will this consume a lot of ‘mobile Data’ when in communication via a mobile device away from a Wi-Fi connection? No you can’t. I would suggest buying a Byron 776 mechanical chime with built in transformer and some bell wire and hard wiring it though. Cost is about £17 but it means you’ll never have to charge it and the white ring around the button is always illuminated.